How to create report of user checkins? I am stuck. I had an engineering manager ask me for a report of the objects his reports have checked in over the last few months, and I am not sure how to proceed. Anyone have any ideas to get this thing rolling? Mostly EPMDocs and WTParts for the objects. He wasn't interested in WTDocuments. I created a search easily enough, but getting that translated into a report has me stumped. Re: How to create report of user checkins? It's because you are using the creator from the epmdocument which is a derived column. 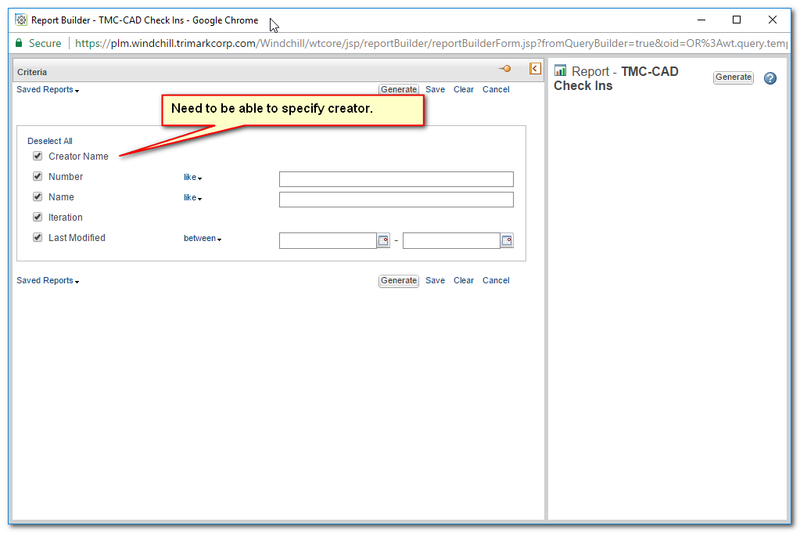 You can add "user table" in the select and add a creator link between user table and epmdocument. That will allow you to filter by user name. That was the trick. I don't create reports all the time, so I have to relearn all these lessons each time. But nevertheless, I successfully created the exact report I needed with your help. thanks for sharing your report. I'll add this discussion to my document. Can you mark this question as answered?